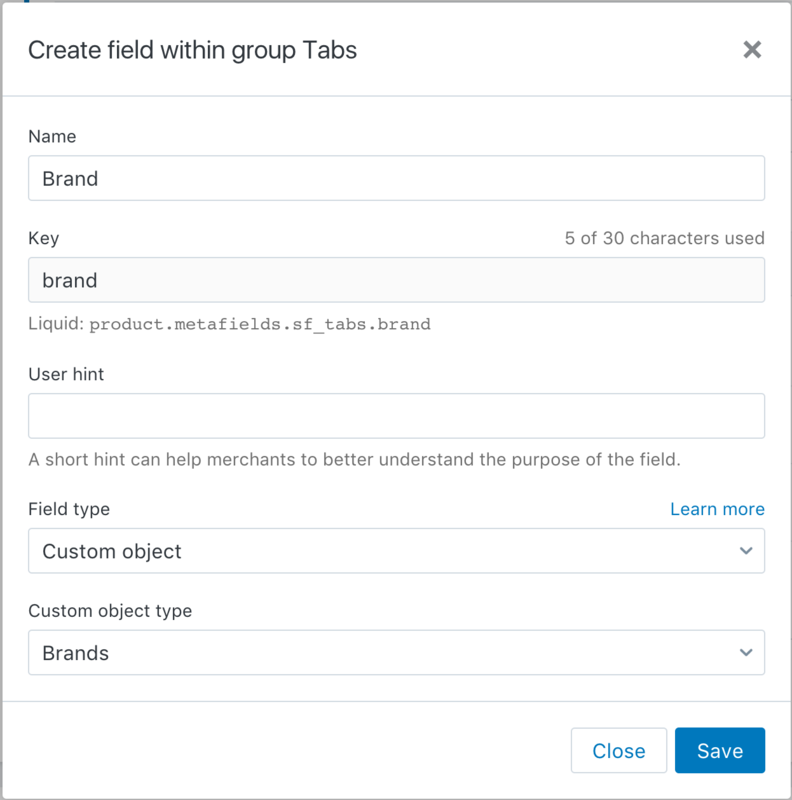 Before custom objects, you could simply create those fields into the product definition, maybe inside a "Brand" group to make it easier to organize. Then, you would go over your products, and you would duplicate the same information for all the products that share the same brand. If you have 10 or more products and realize you've made a typo... you're good to start again from zero, by doing the change as many times as you have products for this brand. Custom objects are an elegant way to solve this issue by allowing you to create your own types, and then creating custom objects for those types. You can then relate those types to a product, article or collection. Now, if you find an error, you just need to edit the text once... and it will update it everywhere. The best is that this feature is entirely based on Shopify metafields infrastructure, so all your content get indexed and served using the super fast Shopify CDN. Create an "author" type, with fields such as name, Twitter URL, Instagram profile, short bio. Then, add a relation to this type within your "Article" resource. Create an "instruction" type, with fields such as description, manual PDF, washing temperature... Then, add a relation to this type within your "Product" resource. Let me guide you through the exciting world of custom objects. Contrary to normal resource definitions, you cannot display Liquid code here. This is because contrary to normal resources (such as "products", "collections"...) that are already unique, those custom type do not exist in Shopify system. Instead, SuperFields will automatically generate a unique metafield namespace when you create the custom object itself. In this short example, I've just created three fields of different type. Please note that, as of today, types cannot have relations to other custom types. 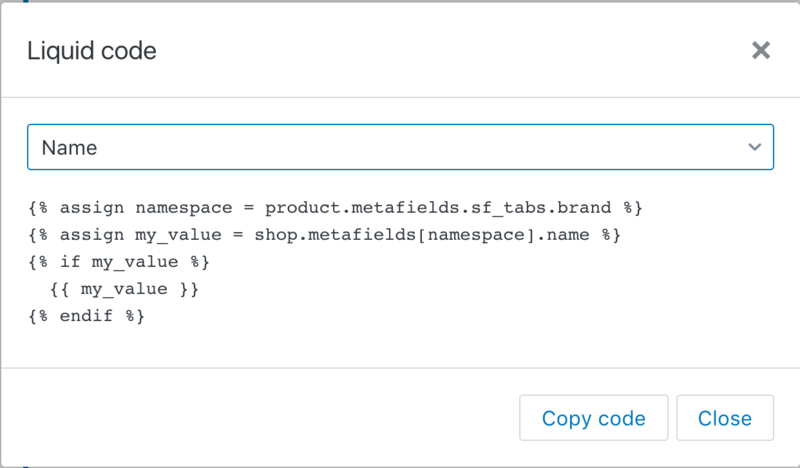 Once you have created the relationship between the product and your custom type, while on the product metafields definition, you can click on the green "code icon". This one will reveal automatically all the fields of your custom type (in our case name, history and logo), and the app will give you an example markup to display it in your code. Use the selector to iterate through all the available properties. Let's go back now to the app home page. Whenever you create a new type, it will appear here, along the traditional Shopify resources. Don't forget to save the metafields before leaving! Just save, and you're done! After a few seconds, assuming that you have properly modified your Liquid code, the information about the brand will display. The beauty of custom objects is that you can now associate this brand to a lot of different product, without having to repeat all the information about the brand. 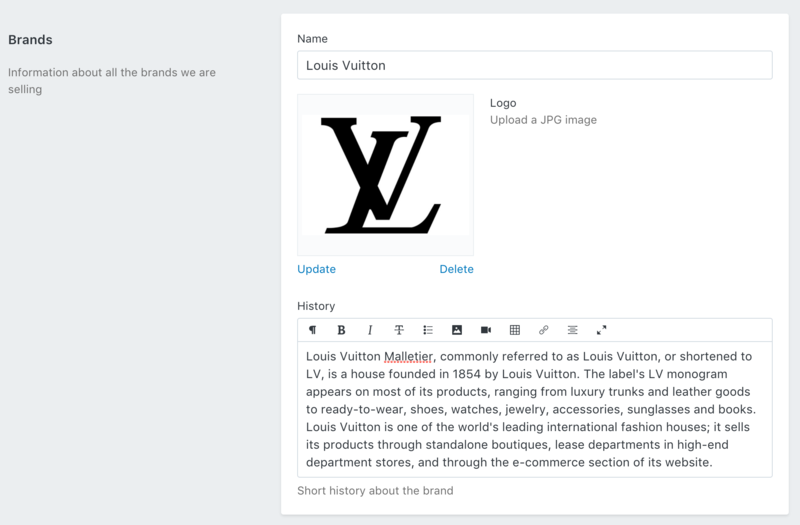 If you ever need to modify information about the brand, you can simply edit it directly from the custom object metafields once, and all the Shopify objects that had a relationship to this custom object will be automatically updated.